For a long time to come, Prophet T.B. Joshua and his church, The Synagogue Church of Nations, will continue to make headlines, for good or for ill. The church made another epoch, last Sunday, when it held, what may enter the Guinness Book Of Records, as the longest singular service ever in the history of contemporary Christianity and Christendom. The service, which featured soul-stirring music by the church's mass choir, healing and prophetic sessions and Word ministration, lasted for 13 hours! Did you say 'oops'? Well, you 'aint' seen anything as the Americans would say. The parishioners participated joyously in every minute, every activity of the extremely long service without showing any visible sign of boredom or tiredness! But unknown to the thousands of exultant parishioners, Marlon, the late Michael Jackson' immediate elder brother, was in the house. He was accompanied by TEE MAC Omatshola Iseli, Nigeria's world renowned flutist, president of Allied Minerals, and Marlon's business associate; two black Mayors, and some associates. Marlon, who has been a regular visitor to Nigeria since the beginning of this year, had arrived Nigeria, upper week, in furtherance of the mega billion dollar tourism empire that he, TEE MAC, and their business associates in America, are going to build in Badagry. But he took time off to consult with Prophet T.B. Joshua, who had foretold the tragic end of his superstar younger brother. The man in The Synagogue did not stop there. He invited TEE MAC to a private meeting and urged him to tell Marlon about the scary revelation about Michael Jackson, and the urgent need for the superstar to rush to Lagos for healing and deliverance. That was on June 12, 2009, the prophet's birthday. “I was very worried about the prediction by the man of God, having followed his past predictions, which came to pass with amazing accuracy,” says TEE MAC in an interview with The Spectator on Wednesday. “So, I called Marlon immediately and told him what the man of God had seen and said. Marlon said Michael was very busy rehearsing at the moment, and that going by what he knew, Michael was okay health-wise.” Sadly, the King of Pop slumped and died in his sprawling mansion in Los Angeles on Thursday, June 25. Contrary to the expectations of the few people that were privy to Marlon's visit to The Synagogue, he met Joshua, in a private suite at the church shortly on arrival at about 3.30p.m. Both men later came down together and Joshua began the healing session at the church's ante area. For close to one hour, Marlon sat, arms folded across his chest, transfixed, watching astounding miracles unfurl before his very eyes. At a point, he seemed so totally lost a white lady had to be explaining certain things to him and he continually nodded or smiled his appreciation. At another point, he gasped in awe as a Cameroonian lady, a self-confessed 'queen of the coast' charged at Joshua a few times as the prophet exorcised the evil spirit from her. Finally, the healing session ended at about 5 p.m. And Prophet Joshua returned to the sanctuary to resume the service. But Marlon, TEE MAC, the Mayors and their associates did not enter with the pastor. To the disappointment of some of the worshippers who later learnt that Marlon was in the house and had been waiting anxiously for that moment when the prophet would introduce him to the congregation, and pray for him as he would do to the scores of foreign dignitaries that regularly throng the place, they left. TEE MAC was to later inform this correspondent that their late arrival from Benin that Sunday caused the alteration in the programme. They were billed to arrive in the church at 9.00 a.m. and start the first service with the congregation, but they missed their flight in Benin, and they had to wait till afternoon for the second and final flight from Benin to Lagos that day. They were dead tired by the time they got to Lagos, and the church, which, perhaps, necessitated the private ministration and audience Joshua granted Marlon. However, there were indications, at press time, that Marlon would “worship fully and openly at The Synagogue whenever he returns to the country. “And that will be very soon,” one of the evangelists confirmed to us. Even though Joshua is renowned for miracles, his prophetic ministry has revved several notches up in recent years with his accurate predictions on some world events. Among the events that he predicted with uncanny accuracy are the death of the former South Korean president, the February 13, 2009 plane crash in New York and the release of Ingrid Betancourt from the Colombian jungle last year. “His ministry is attracting a growing fanatical following, particularly across Africa, and many African leaders such as John Evans Atta Mills of Ghana regularly frequent his church for spiritual support and guidance,” informs a regular worshipper in the church. The Associated Press, AP, reported Wednesday that Dr. Conrad Murray, the superstar's personal doctor, has admitted to police that he actually “gave Michael shots of propofol. Propofol is believed to be the killing agent behind Jackson's death and is a sedative given intravenously in hospitals to knock patients out for surgery -- only Murray was using it to help Jackson sleep.” With investigators narrowing their scrutiny to Murray, the United States Drug Enforcement Administration (DEA) spent hours at the doctor's house and clinic in Las Vegas; and evidence gathered so far may lead them charging him for manslaughter. TEE MAC Omatshola Iseli, Nigeria' s internationally acclaimed flutist, and president of Allied Minerals, a mining company, is a long time family friend of the legendary Jackson family. He is also a personal friend and business associate of Marlon Jackson, the immediate elder brother of Michael Jackson, the iconic King of Pop who died suddenly on June 25, 2009. In this interview, TEE MAC confirmed that Prophet T.B. Joshua consulted and implored him to pressurise the Jackson Family, especially Marlon, to persuade the superstar to come to his church at Ikotun, Lagos for healing. Michael never got the message because he was immersed in rehearsals for his 50 'This Is It' residency gigs at the O2 Arena in London. TEE MAC believes that Michael would have lived had he made the trip. Spectator: How did you get to know about Pastor T.B. Joshua's prophecy concerning Michael Jackson's unfortunate demise? Tee Mac: On June 12, this year, I went to the birthday party of Prophet T.B. Joshua and he sent somebody to call me upstairs to talk. He told me that Michael Jackson was very sick and needed healing and deliverance. He stated that I should tell Marlon (Jackson, the late legend's immediate elder brother) immediately to bring Michael to Nigeria, specifically to The Synagogue. He said Michael was in great danger and needed urgent divine help. Spectator: How did you react? Did you tell Marlon and what was his reaction? And Michael's, too, if they ever told him about T.B. Joshua. Tee Mac: I was very worried about the prediction by the man of God, having followed his past predictions, which came to pass with amazing accuracy. So, I called Marlon immediately and told him what the man of God had seen and said. Marlon said Michael was very busy rehearsing at the moment, and that going by what he knew, Michael was okay health-wise. It is regrettable that Michael never made the trip to Nigeria. It is lamentable that he died the way he did. Spectator: Do you really believe that if Michael had made it to Prophet Joshua, he would have lived? Tee Mac: With what I have seen over the years at The Synagogue, I believe that Prophet T.B. Joshua could have done what he always does: heal Michael. Spectator: Are you a member of the church? If yes, how long have you been? And what took you there? Tee Mac: I am a close friend of the Man of God. I am not actually a member of The Synagogue but I have always admired the Man of God for the help he renders to everybody without asking for anything in return. He has helped so many musicians we sent to him; and I think we should all rally around him and make a statement to the world that those who talk bad about him don't even know him. Spectator: Can you tell us a few of Prophet T.B. Joshua's prophesy that awed you and reinforced your belief in his ministry? Tee Mac: When Chief Abiola asked him if he would win the disputed June 12, 1993 presidential election, Prophet T.B. Joshua stated yes, but you will not become the President of Nigeria, and there are other predictions that he made that have come to pass with astonishing accuracy. Let me stop at the Abiola example for now. Spectator: TEE MAC has never been known to be a religious person. How did you become a Christian and a worshipper at The Synagogue? Tee Mac: You are very wrong there. Shola, contrary to your belief about me, I am a very religious person having studied religious philosophy my whole life. I respect every religion and enjoy worshiping with serious people because every religion has some truth. Spectator: Finally, how do you react to the plethora of bad publicity T.B. Joshua keeps getting despite the enormous work he is doing in the lives of people all over the world? Tee Mac: I am going through the same thing with PMAN (Performing Musicians Association of Nigeria). There are journalists who don't verify their stories and they just write anything because somebody has given them money. A lot of people are simply jealous about the tremendous respect Prophet T.B. Joshua has worldwide. Some of the critics are pastors who have all the grammar in the world but no healing power, who have no power to deliver. Spectator: Those who criticize him most are failed prophets, did you say? Tee Mac: Your words, not mine. But you are right in a way. The most ardent critics of Prophet T.B. Joshua are failed pastors and prophets. They are jealous and think that Prophet T.B. Joshua gets his power from some magical entity or through black magic. Black magic and juju is an illusion of the illiterates and that makes them illiterate too. Last year, over 60,000 people came from all over the world to worship at The Synagogue. That makes The Synagogue the number one tourist place in Nigeria. 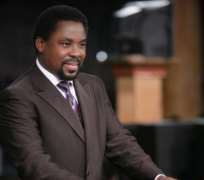 I have spoken to countless people who came from countless countries and nobody has ever spoken ill about Prophet T. B. Joshua. One of my Indian mining friends had a back problem for over 15 years and when the Man of God touched him during the prayer line, the problem went away. I still receive mails where my friend always sends his regards to the Prophet.